With just over two months before voting day, more people have come out to denounce the way the elections are being run, saying that come April 17, they will simply stay away from polling stations. Social media is flooded with people expressing dissilusionment at the lack of a real choice, the lack of appeal for them to vote and that their interests have been ignored or sidelined by candidates and political parties. This is true particularly with the presidential race, which presents the same two candidates as in 2014. The legislative elections are not necessarily better, but either way, they will be affected by the boycott as the two elections will be held on the same day. Incumbent President Joko “Jokowi” Widodo, who began the election campaign with a massive lead, has the most to worry about as many of his traditional supporters have expressed disappointment at some of his recent decisions, including his choice of conservative Muslim cleric Ma’ruf Amin as running mate and the planned parole for terror convict Abu Bakar Basyir (although the decision was postponed 24 hours later). Those who voted for Jokowi in 2014, believing he would address human rights issues and rising cases of persecution against religious minorities and the lesbian, gay, bisexual and transgender community have been disappointed with his performance in the last five years. Some say they will boycott the elections. Others are concerned that Jokowi appears to be veering further to the right, playing into the hands of Muslim conservatives and the military. 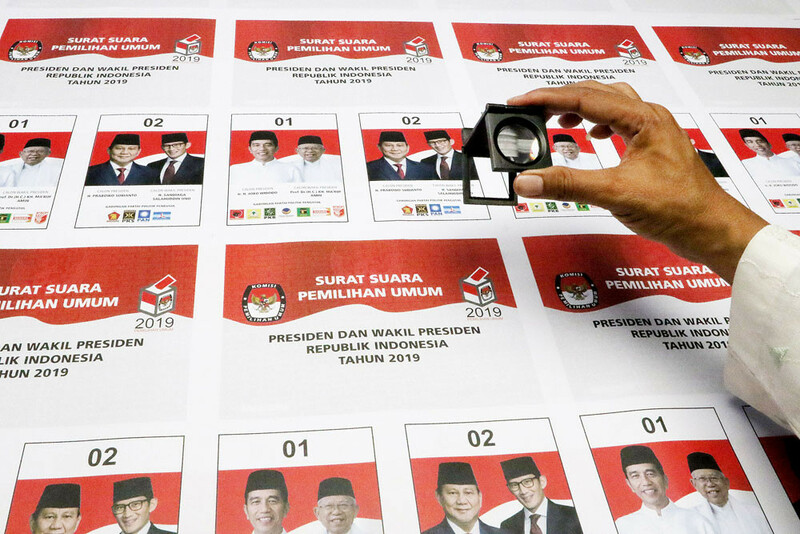 Rather than giving their vote to challenger Prabowo Subianto, disillusioned voters have declared themselves golput, a term coined during general elections under Soeharto that referred to protest votes against the electoral system designed to ensure his victory. Golput, short for golongan putih, is a bastardization of the word Golkar, Soeharto’s political machine that won all six general elections for him, giving legitimacy for him to rule for more than three decades. In those days, disillusioned voters would go to polling stations to spoil their ballots, ensuring that they were registered and that their ballots were cast, while stopping government electoral officials from casting the ballots for them. To ensure complete victory for Golkar and Soeharto, the elections were held on a working day and civil servants would vote at their offices. In Indonesia’s occupied East Timor (now Timor Leste), zealous electoral officials bragged of 105 percent voter turnout, all for Golkar. This time around, many who have professed to be golput say they would vote with their feet in April. But by doing so, they would miss out on the opportunity to send the clearest signal to the political establishment of their disenchantment with the electoral system. Instead, they will be lumped with the hordes of apathetic people who long ago decided that their votes mattered little one way or another and that they would accept the results come what may. They are more likely taking advantage of the national holiday on voting day by leaving town. For the good of democracy, Indonesia should capture dissillusioned voters. Unlike apathetic voters, they still believe in democracy. Their voices need to be heard, if only because they care. In India, where they have introduced e-voting, voters are offered a none of the above (NOTA) option on the menu of candidates or parties. In some districts, NOTA beat all the candidates. Capturing the voice of dissilussioned voters is not such a novelty in Indonesia. Committees running elections for governors, mayors or regency chiefs in 2017 and 2018 provided a box as an option in areas where there was only one candidate running. In one or two areas, the boxes received more votes and were declared the winner. The elections had to be repeated. The General Elections Commission (KPU) has expressed concern at the growing number of people declaring themselves to be golput and it has launched a massive campaign to encourage voters to exercise their democratic rights. The two presidential candidates and those candidates running for the various legislatures have also been going around warning that those who join golput will miss out on the opportunity to decide on the national leadership and therefore forfeit their right to complain. Unlike in neighboring Australia and Singapore, voting is not compulsory in Indonesia. Not voting, therefore, is a right that has to be respected. In 2014, voter turnout was 70 percent, a respectable figure for an open democracy. In local elections, turnouts veered to the 50 percent mark. Sadly, electoral statistics can not distinguish between those who were simply apathetic to begin with and those who wanted to vote but are now too dissilusioned to come out on April 17. Understandbly, the KPU is concerned that a low turnout would be used as an indicator of its poor performance. Others say a low turnout would cast doubt about the legitimacy of elected officials. But rather than trying to scare people into voting, the KPU should find a way of accommodating the voices of dissillusioned voters. A NOTA option on the ballots would result in both a higher turnout and a measure of the disenchanted voters. This can only be good for democracy in 2024.